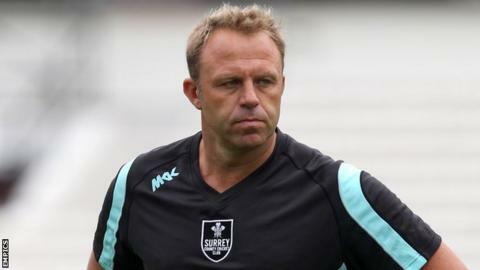 Surrey team director Chris Adams has praised his players for their efforts after the death of batsman Tom Maynard. The Oval side avoided relegation to Division Two of the County Championship in the penultimate game of the season. He told BBC London 94.9: "We're all very pleased to get to the end of the season, especially with our Division One status retained. "You don't always highlight staying in a division but, in the circumstances, that was a fabulous achievement." He added: "I congratulate them for the hard work, effort and graft to get to that outcome." Adams says that Maynard's death in June, when he was hit by a train, had an impact on everyone at the club. "It's been tough for everybody involved on and off the field," he continued. "It's been a very difficult summer and we will remember it for the tragic loss of a wonderful talent and a very special person. "We've all been left reeling from the tragic events." Adams reserved special praise for Gareth Batty, who took over as captain in the second half of the season after regular skipper Rory Hamilton-Brown took a break from the game following Maynard's death. "Gareth has been outstanding," Adams said. "When we considered the fall-out of Tom's death, Rory stepping down as captain and how to repair the side, there was only ever one person I felt could lead the side. "Both with the experience of being able to make the right calls tactically, but also to act as a figurehead for the side. "There are few players I've come across that work harder on their game than Gareth Batty. "I can't heap enough praise on him; how he's been and how he's handled the responsibility of leadership and rallied the troops." Batty, who signed a new two-year deal with Surrey this week, says the playing squad found it difficult to come to terms with Maynard's death in mid-season. "It was just about getting through the season and making sure we looked after each other," Batty told BBC London 94.9. "God willing, the cricket looked after itself. "Normally when people are grieving they are afforded some time. We had cricket to be played so we had to keep going. "It was very difficult for everyone concerned and everyone did what they could for each other. "Every player needs a bit of time to reflect on a very emotional time. We will come back bigger and stronger next year." Adams is looking for the side to keep improving once they have come to terms with the events of the past few months. "As a young group they can reflect on a season where tragic events happened, but we still have the opportunity to come back next year and win the Championship," he said. "We're not in bad shape. We've got some repairing to do. "There are people who have been deeply affected by what happened this summer. "The future is very much about working with the players and the coaching staff, enhancing how we do things and working out how we can get better. "It's with one goal - to be the best that we can. "Whether that means winning a Championship, a one-day competition, producing England players or our own players coming through; all those factors show the ambition within the team and ambition within me."